The Pathfinder wind farm project, would cost $8 billion, including the construction of a 2,100 MW wind farm in Wyoming, a compressed energy storage (CAES) facility in Utah, and the transmission lines needed to bring electricity from the Wyoming wind farm to Los Angeles, California. 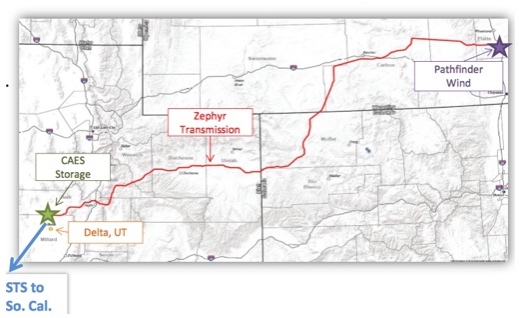 Map of proposed 500 mile transmission line from Wyoming to Utah, CAES facility. Four companies are involved in the project, Pathfinder Renewable Wind Energy, Magnum Energy, Dresser-Rand and Duke-American Transmission. The centerpiece of the project is the $1.5 billion CAES storage facility at the existing Intermountain Power Generation site in Utah. It will be ten times larger than the only other CAES facility in the United States, located in Alabama, which is rated 110 MW. CAES facilities are expensive and add to the cost of electricity. Obviously, a $1.5 billion CAES facility has to be amortized against the use of electricity, the cost of which will be borne by consumers. They are however, less expensive than batteries that are not suited for such large storage requirements. Only pumped storage could provide the required amounts of storage, and they require ideal siting with the formation of a lake behind a dam, where many environmentalists are opposed to building dams. Storage of this size would not be necessary if it weren’t for Renewable Portfolio Standards (RPS) requiring the replacement of fossil fuels with renewables such as wind. 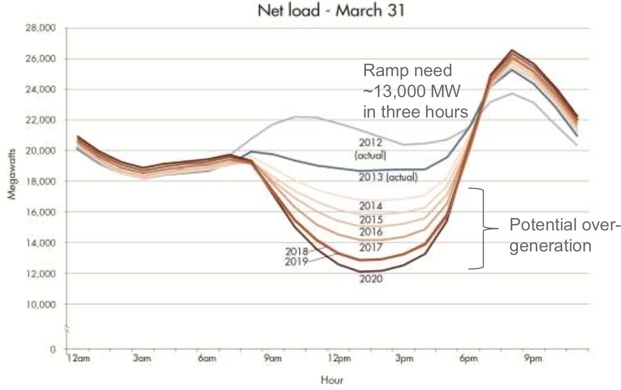 The California Independent System Operator (CAISO) Duck curve demonstrates why storage is necessary, especially in California where the state has mandated an RPS of 33% by 2020 and 50% by 2030. The belly of the curve shows how renewables displace conventionally generated electricity, with increasingly large amounts being displaced, and with increasingly large ramping up in the evening when the sun sets. Storage is required to minimize the ramping, where ramping creates huge stresses on the system. In addition, storage is needed to replace wind and solar when the wind doesn’t blow and the sun doesn’t shine, when fossil fuels have been precluded as backup alternatives. A more complete explanation is in Nothing to Fear. The Utah location is ideal for a CAES facility, as the existing Intermountain generating facility is located over a large salt deposit that is approximately 10,000 feet thick, which can be excavated hydraulically to create caverns capable of storing large quantities of compressed air. There would be four caverns, with each cavern being 300 feet in diameter and over 1,000 feet high. The entire project, from start to finish demonstrates the absurd cost of wind energy. The wind farm is likely to have a capacity factor of 35%, which is better than wind farms built in Eastern states. The entire wind farm would therefore be equivalent to one, 900 MW natural gas combined cycle (NGCC) power plant. The cost of electricity from the wind farm will be around 10 cents per kWh, before it’s transmitted to Utah. The CAES facility is not 100% efficient so there will be less electricity shipped to Los Angeles than was received from the wind farm in Wyoming. The amortized cost of the CAES facility must be added to the cost of electricity. There are also transmission line-losses, probably twice as large as with traditional fossil fuel power generation due to the long distances involved. Interestingly, environmental groups constantly berate line-losses from fossil fuel power plants, which are probably about half the line-losses that will be incurred by this wind project. Line-losses are typically cited at around 6% for traditional generating plants, which are rarely located more than 500 miles from where the electricity is consumed. This wind project is shipping electricity about twice that distance, or around 1,000 miles. The approximately $3 billion cost of building the nearly 1,000 miles of transmission lines should also be included. However, a new 900 MW NGCC power plant would also require a new transmission line, but that line would probably be less than 1/3 the length. All told, the cost of electricity to the consumer from this project could be at least three times higher than would be the case with a single (NGCC) power plant, or around 18 cents per kWh for the Wyoming wind, versus 6 cents per kWh for an NGCC plant. The entire $8 billion project could be replaced with a single 900 MW NGCC power plant located 100 miles or so from Los Angeles at 1/5 the cost, or approximately 20% of the cost of the Pathfinder and Intermountain project cost. With a project of this size, where CAES of this size has never been built before, there is no guarantee that costs won’t escalate. It should be noted that electricity in California is already twice as expensive as in Louisiana, Arkansas and Oklahoma, where coal or natural gas are the primary methods for generating electricity. This is part of the penalty for trying to eliminate the use of fossil fuels for generating electricity in California. 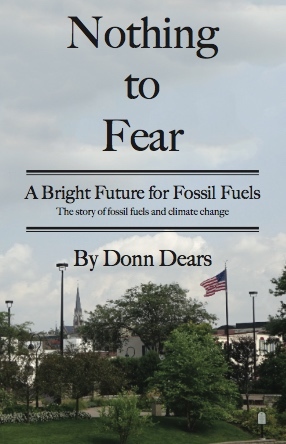 Nothing to Fear, Chapter 9, The Utility Death Spiral, explains why displacing fossil fuels with wind and solar will result in the bankruptcy of Utilities and the possible takeover of the industry by the government. Thanks for this analysis. Are there any pilot plant projects that have shown that CAES is reliable and efficient? This is such a large project that it seems ‘concept to factory’ would be risky. Also, why do you think they have not chosen battery storage instead? I should have gone back and read your blog post on storage. You mentioned one large scale CAES system in Germany and one in Alabama. So apparently they work but they are expensive. The CAES system is to be rated 1,200 MW. A trailer sized battery storage system would probably be rated 1 MW, so it would require 1,200 trailer sized battery storage units, plus the space for connections etc. It’s very difficult to estimate the cost of battery storage of this magnitude since there are no systems of this size, but the cost would likely be over $2 billion. Besides the cost, the batteries would have to be replaced every 15 to 30 years, depending on charging and discharging cycles, while the CAES system should be able to last for 40 years or more without the need to replace major components. It should be noted there are several types of batteries, but most proposals are currently using Li-ion batteries. Flow batteries are an alternative that have received some consideration. Most battery storage systems are for 100 MW or less. Bottom line, there would be very little need for storage if it weren’t for the need to accommodate wind and solar. Also the energy density per kg of compressed air is similar to lead based batteries, the cheapest batteries you can buy and manufacture. Thanks for the comment. That of course depends on the compression.